Nestled between Poland and Lithuania, this region boasts mild winters and a capricious summer that attracts many thousands of tourists every year. Imagine sipping from a thermos full of hot tea in August, gazing at the setting sun as it transforms the sky from bright orange to deep purple with your toes in pearl colored sand – not too shabby! Kaliningrad became part of the Soviet Union after World War II as a result of the Potsdam agreements of 1945. 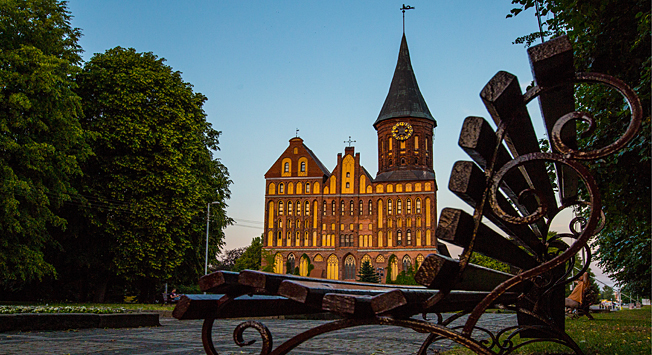 Passionate about the area’s historical past, locals love to call modern Kaliningrad by its original German name - Königsberg. A neighbor to several European countries it lacks land borders with Russia, making this region unique in many ways. The Russian people have inherited fresh sea air, pine forests, golden dunes, traditional German houses and lands imbued with a rich history. Traditionally the best way to start exploring is by paying homage to the great philosopher Immanuel Kant. The original resting place for the father of metaphysics was inside the Königsberg Cathedral. However, Kant’s tomb is now outside, adjoining the northeast corner of the building. Walk around this beautiful gothic style cathedral, treat your ears to a classical organ concert inside and learn about Königsberg’s history at Kant’s Museum. This is one destination you Kant miss! Where do the roads go? Large gates that lead to the city’s main thoroughfares form part of Kaliningrad’s charm. There are three “must see’’ gates in Königsberg and they are close to one another: Sackheim and King’s Gates on Litovsky Val and Rosgartener Gate on Vasilevskogo Square. Inside Sackheim Gate, which recently added a modern art museum, there are small exhibitions, master classes and cultural events, such as Opera Lover’s Night. The excellent acoustics guarantee a rich and sonic experience. Next is the King’s Gate, the archway that once welcomed Prussian rulers. Nearly destroyed in World War II, it comprises its original form due to a restoration project. There is a historical exhibition inside. The Rosgartener Gate is situated near the Amber Museum, another cultural destination worthy of attention. Inside the gate is a restaurant with a scenic summer terrace in the middle of a moat surrounding an old tower. This is a great place to enjoy an evening cocktail. If you are looking for a little adventure, take a trip outside the center to Nevskogo Street. Here you can explore the mysterious dungeons of Fort #3 (King Friedrich-Wilhelm I). This stone citadel was built along an encroaching forest and was the largest fort in a defensive ring surrounding Königsberg. Be sure to bring flashlights and comfortable shoes, as it is abandoned and there is no formal tourist infrastructure. The less intrepid can head to Fort #5 (King Friedrich-Wilhelm III) for a guided tour. Checking out the Amalienau neighborhood, where you can still experience the rich atmosphere of a Prussian town, is an absolute must for all visitors. While German architecture is usually restrained and austere, Villa Leo (16 Kashtanovaya Alley) stands out. Commissioned by Ludwig Leo, a city councilor and shipping tycoon, this whimsical manor indulges in an abundance of carved decorations and a multilevel-tiled roof. In Amalienau you can hunt down dozens of villas using an old map of Königsberg. Get a taste for old Kaliningrad at the Altes House Museum Apartment(12 Pugacheva Street). Be prepared to solve puzzles, enjoy amazing stories and listen to a harmonium while surrounded by antiques that have been acquired from old attics, flea markets and auctions. How do people in Kaliningrad live now? On the former Hornshtrasse Street, Artem Ryzhkov, a film critic and writer, has opened his apartment to the public. He invites visitors to watch rare movies, listen to vintage records and check out live performances. Everything at Kvartira Art Space (13 Koloskova Street) is for sale. If you see a book, record or anything else that tickles your fancy, just ask for the price. For a leisurely stroll take the pedestrian walkway around Verkhnee Lake with old-fashioned iron lampposts lighting your way. To keep the kids entertained, visit Yunost Park across from Telmana Street. There’s a Ferris wheel, an upside-down house and a beautiful pond full of swans. To learn about the high seas and the big ships that explored them, head to the World Ocean Museum where you can board a Russian B-413 submarine docked on the Pregel River. Beyond the city of Kaliningrad, be sure to visit Svetlogorsk and Zelenogradsk, Russia’s westernmost point of entry. Climb the 30-meter dune in the Curonian Spit National Park, discover beautiful architecture in Chernyakhovsk and relax on the beaches in Yantarny. It will take you at least a few days to check out everything in the Kaliningrad Region, but the memories will remain with you for a lifetime.